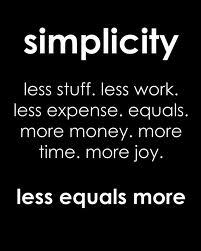 10 Tips to Simplify Your Life and Improve your Happiness - Something New Everyday! Over the last decade or so life has consistently been enriched because of more and more facilities, on-going gadgets inventions and day by day increment in luxuries. This is quite exciting however during the same period of time, people have increased their love for materialistic things abruptly which has directly or indirectly reduced their overall happiness index. Now a days, we have more luxuries but less delights and high stress levels. We have more sugar, blood and heart patients then it used to be a decade back. The reason for all the stress and anxiety is simple that we are not living a simple life. Below are some tips which can simplify your life and may amplify the happiness scale of your life. 1- Avoid getting influenced: You don't have to follow every single trend in society. If your friend has purchased a new BMW, you don't need to buy a Mercedes to impress. Live for yourself not for others. If you purchase a high-end luxury car today, your love for this will end soon and you will be selling it at considerable financial loss though I am not forbidding to purchase luxury things once in a considerable duration of time. 2- Avoid impulse buying: You don't need to buy every single gadget instantly which you like in this shop. Do your Needs Vs Wants analysis. Buy only if it is really increasing your peace of mind. Remember that now a days the standard life of every gadget (phone, tablet, laptop, jewelry etc) is more or less 6 months because of new and new products release by several companies. 3- The 6 months Rule: Generally speaking, anything which has not been used in last 6 months will not be used in next 6 months most likely. Give such things (shoes, garments, toys, mobiles, house hold items) in charity. This will help spreading happiness in society and reducing your space at home. 4- Avoid Credit Cards Usage: Avoid this as much as you can. Debt is a silent stress and eating up your mental health slowly. Your brain might get old while you are young at heart. You might develop high BP or sugar because of stress due to credit. Live a credit-free life. 5- Learn to say No: Don't accept every single attractive offer from the bank representative or a car loan company. Do your "Needs Vs Wants" analysis. Careful spending is always recommended. 6- Reduce too much social gatherings: Stay at home. Spend quality time with your spouse and kids for empowered relationships. You don't have to say yes every time to your friend who is coming to pick you from home to join another late night social get together. 7- Reduce your love for money: Careful spending and saving is important but don't allow your brain to keep doing the calculations all day long. You love for money is pulling your brain strings and damaging your peace of mind silently. Stay away from too much thoughts about your financials. 8- Less TV more Books: It is proven that people who watch more movies generate high level of stress. Read quality books to learn wisdom and attain high degree of happiness. 9- Spend time with Nature: Instead of going to cinemas and malls repeatedly, spend time in parks. This will relax your brain, body and soul. 10- Change your eating habits: why eating lavish foods by visiting costly restaurants again and again in a week. The purpose of food is to fill your belly for some hours. So the suggestion here is to go for simpler and healthier food. Remember, most of the food items in the market are fried which are increasing your cholesterol level silently hence making you a heart patient in the long run!